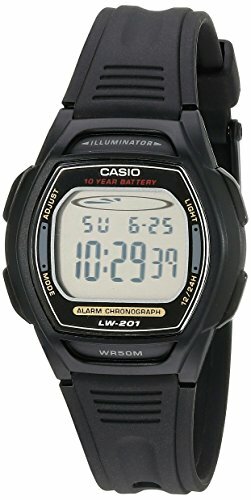 A sporty, no-nonsense design and plenty of innovative features give this Chronograph Watch #LW201-1AV from Casio its classic appeal. Offering the precision and reliability of quartz movement, this casual timepiece has a mineral crystal to guard against scratches, an LED light with afterglow for dim conditions, and a dual time option. There's also a daily alarm, hourly time signal, and auto calendar to keep your day going smoothly. Water resistant to 165 feet, this Casio original is perfect for the active woman who wants a watch that both looks good and delivers solid performance year after year. This watch is protected by a one-year manufacturer's warranty.